If you have an idea, we can research its feasibility for you. Our staff has extensive experience in researching the need for and feasibility of product ideas in today's competitive markets. Services include market niche and needs research and analyses, comparative product studies, product feature analysis, patentability analyses, concept validation, systems simulation, and preliminary design studies. We are experts at developing your idea into a workable, produceable product. If you know "what" you want your product to do, we can help you figure out "how" by finding the best technology at the right cost to bring your idea to market. We specialize in matching the design to the available development and production budget, advising you on the best ways to meet requirements while keeping costs under control. We can design an entire product or a single component, from the basic system concept through the final production model, including hardware for circuits, subsystems, and antennas; microprocessor interfacing; firmware; and software. We use an incremental building block approach, testing at each stage of the design to simplify debugging and design rework. We utilize the latest programmable logic devices, such as Coolrunner PLDs and Xilinx FPGAs. We use a variety of PLD design tools including VHDL, Verilog, and Schematic Entry. We are experienced with OrCAD, Autocad, Spice, and many other design programs, and use these tools on a daily basis. Several of our products have won major design awards for their innovative design approaches and concepts. We can provide inhouse PCB layout service, using several of the best PCBCAE/CAD tools such as OrCAD Layout. 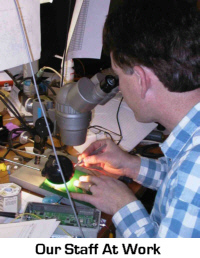 We have favorable arrangements with several prototyping firms to provide high quality PCBs for prototypes with quick turnaround in small quantities. The prototype board is the same physical size as the ultimate product. Since the board itself must be considered a component for many RF systems, this is a distinct advantage in ensuring final product quality. Surface mount components are physically smaller than their through-hole equivalents, thus are less affected by parasitic effects. It is easier to change out resistors and capacitors to try different values. The board lasts through more component changes than a through-hole board. For a complete discussion of our approach to prototyping, click here. Sometimes it makes sense to do some extensive testing before moving to completely customized systems. Sometimes, it makes sense to use already existing parts to build a finished system. Sometimes a project may involve large-scale data collection at the lowest possible cost. For any of these situations, we can help! We are experts at assisting in developing specifications for systems, designing and manufacturing any custom components, purchasing commercial off-the-shelf (COTS) components, configuring the systems, and packaging the systems for shipment to the end locations. We can also perform data analysis of field trial results, and you have the assurance of an experienced engineer readily available to help you through all phases of the project. For more information and some examples of work we have done of this type, see our System Integration and Proof of Concept page. FCC and international approvals for your unlicensed products can be a real hassle. Pegasus Technologies has extensive experience in guiding products through the testing and approval process in a timely manner so that production schedules are not compromised. The key to our success is early and frequent discussions with the certified test labs so that problems can be minimized along the way. If you plan to use a contract manufacturer (CM), we can provide full support to you including CM selection, parts acquisition, scheduling, troubleshooting, design of testing programs, and acceptance testing. Rely on us to take the headaches out of the manufacturing process for your product! Pegasus Technologies can provide full design review and critique of your existing designs. Perhaps you want an independent design review before committing to production, or perhaps you are having problems with a design that is not performing up to specification. We can help! Services include design analysis and validation, troubleshooting, "sanity checking" and risk assessment. We can also provide continuing support on designs that we created for you, including updates, modifications, or troubleshooting any problems that might arise during manufacture or use. Is your facility having signal quality or interference with your WiFi installation? We can help! It is not unusual for a large site to have areas that have poor signal coverage or that just don't live up to expectations. The RF Wireless experts at Pegasus Technologies can analyze your site and configuration to fix your wireless network where it is broken. We can do the traditional active and passive site surveys just like the original installer of the network should have done, but our extensive RF expertise allows us to go way beyond those tools. We can measure and identify rarely-occurring interference and track it down to its source. We are not happy until you are delighted with your WLAN performance at all locations in your facility. How much does this cost!? Because of our expertise and experience we are usually able to complete a difficult troubleshooting job much faster than a traditional WLAN installation company. Just give us a call and find out how inexpensive it will be to get a world-class team working for you. Preparation and delivery of training packages to meet your needs, whether for a specific product or wireless technology in general. Mentoring your engineering staff so you can develop your own in-house wireless and digital expertise. Assistance in intellectual property matters, including patent disclosure preparation / review, patent claim analysis, prior art research and serving as an expert witness in patent litigation matters. Technical writing and editing for manuals, brochures, flyers, and other market literature, including graphic design, layout, and production. This site copyright © 2000 - 2015 by Pegasus Technologies, Inc. All rights reserved.